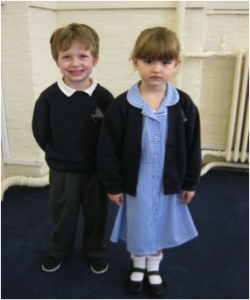 Children wear navy blue jumpers, white shirts and grey trousers or skirts. In the summer girls can wear blue and white dresses with a navy cardigan. 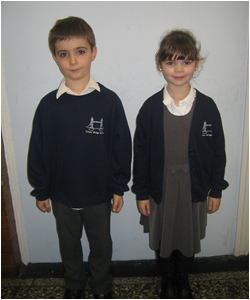 Please mark all school uniform with your child’s name. Please make sure your child wears sensible shoes to school. It is also best if your child is able to do up his/her shoes on their own! Children also need a PE kit in school. They should bring it on a Monday and take it home on a Friday for washing. They need a white T shirt, navy blue shorts and plimsolls or trainers (tracksuit in the winter). Children should not wear jewellery to school. However, if your child has pierced ears, they may wear small studs only. Watches are allowed. Sweatshirts with the school logo can be purchased from our school office.